Never be outworked, underprepared, cut corners, or back down in the face of adversity. That’s how Kevin was raised, and how he approaches every day as he defends clients who have been charged with criminal offenses. Kevin understands that each client’s case is different and takes a personalized approach to defending his clients and standing up for their rights. Kevin is a native of Chapin, South Carolina, where he spent his youth playing sports, hunting, fishing, and working on his family’s horse farm. Kevin attributes his unmatched work ethic to lessons taught by his parents and examples set by 3 generations of attorneys that came before him. Kevin attended the University of South Carolina, where he double majored in business management and economics, with a minor in Political science. He was an active member of Sigma Nu Fraternity and served as the co-chairman of the university’s Ducks Unlimited Chapter. Kevin then attended Charlotte School of Law, where he focused his legal education on trial advocacy and litigation. Kevin realized that his future as a lawyer would be in the courtroom through his experiences with CSL’s various trial teams. Kevin was instrumental in many of these teams receiving numerous national and regional honors. Kevin also served as the Associate Chief Justice for the school’s Trial Advocacy Honor Board. After completing law school, Kevin began his legal career as an Assistant District Attorney in Mecklenburg County. During his near four-year tenure at the Mecklenburg County District Attorney’s Office, he prosecuted misdemeanor charges including driving while impaired (DWI), misdemeanor death by motor vehicle, drug offenses, assaults, and various traffic violations. Kevin also prosecuted felony charges ranging from breaking and entering, larceny, and possession of stolen vehicle, to gun charges and an array of financial crimes. Kevin has tried hundreds of district court trials and in excess of 20 jury trials in superior court. 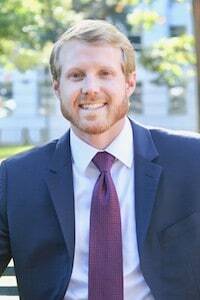 Kevin joined Fanney Law Office in 2018 where he utilizes his experience, knowledge, and skills developed as a prosecutor to zealously advocate and defend the rights of clients charged with driving while impaired (DWI), misdemeanors, felonies, and traffic violations. Kevin will apply his unmatched work ethic and experience to your legal situation in an effort to provide you the best defense possible.